There will be a meeting for everyone interested in doing tech for “Joseph and the Amazing Technicolor Dream Coat” on Friday at 3:15pm in the choir room. If possible, please fill out the tech interest form here prior to the meeting. If you are unable to attend the meeting, please fill out the tech interest form and check back to this post for a copy of the presentation. You may also email Jimmy at jstocco@theloftstage.org with any questions. Auditions will be Monday, September 11th and Wednesday, September 13th with callbacks on Thursday, September 14th. Please meet right after school in the Loft Theatre. If you are able to audition Monday, please do so. This year the fall musical will be Joseph and the Technicolor Dreamcoat. The one act will be Women and War with the spring play being Scapino!. Lofties will be going to see In The Heights on Sunday, September 17th at the Ordway. We will be meeting at ERHS at 12:45pm to take a bus to the Ordway. There will be more opportunities for shows. There will be a tech meeting on Friday, September 15th immediately after school in the choir room. Don’t forget to get set up on Remind 101, Loftie Newsletter and the Facebook page, so you can keep up to date with Loftie news. We will do a ticket exchange with the Woodbury High School Theatre program to see their fall musical, which is High School Musical! There will be a movie night at the Loft Theatre on Friday, December 15th. We will share the time as it gets closer. We are planning on going to see Newsies at Chanhassen Dinner Theatre and the date and time will be shared at a later date. East Ridge High School is looking for enthusiastic 4th-6th graders to join the children’s chorus for our fall musical, Joseph and the Amazing Technicolor Dreamcoat. The production will rehearse September 18th – November 2nd with shows running the first two weekends in November. Sign-ups and registration can be found HERE. 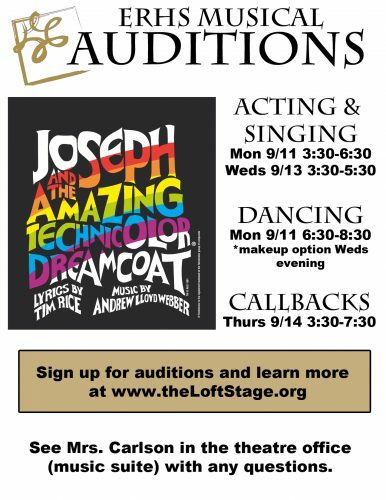 Auditions for this year’s fall musical, Joseph and the Amazing Technicolor Dreamcoat, are Monday (9/11) from 3:30-6:30 and Wednesday (9/13) from 3:30-5:30. Performers may prepare thirty-two bars of music or learn a song provided at auditions. Those preparing a song should bring a digital track with which to sing; accompaniment will NOT be provided. Keep in mind the vocal style and range of the show. Dance auditions will be Monday (9/11) from 6:30-8:30. Please bring water and dress for movement. Students will learn and perform a brief dance during this time. If, for some reason, a student is unable to make Monday night’s dance audition, the make-up session will be Wednesday evening. See Kajsa Jones or Mrs. Carlson if a make-up session is needed. Callbacks will be Thursday (9/14) from 3:30-7:30. Have fun learning how Improv works – get to do a performance and see a professional performance at the end! Auditions – Middle School and High School offerings. Flexible days – work on your dance, acting and singing for the next audition.